I want to thank DBJ for having me on! The man is the Johnny Carson of RPG streaming, he really is that good. 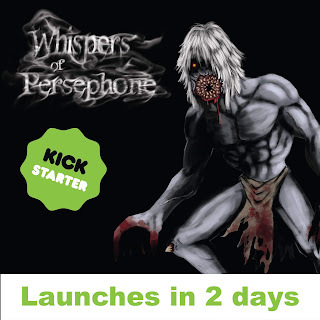 I came back to this post to add some information about Whispers of Persephone as these final days before the KickStarter launch have engulfed me. I want to add a few notes about getting your launch together (as best you can) and about crowdfunding projects in general. Last night I worked on the campaign video. At this point I expect to complete the video Friday night, just in time for the campaign launch. Nothing quite like cutting it close, right?! The video I'm assembling is a simple affair, consisting of illustrations from the book, captions, and (if I can get it to work without corrupting the whole file) voice over work by yours truly. Here's hoping it comes together nicely. Here is some advise though: If you are like me, and are not adept at creating video content, it is a good idea to find someone who is skilled in this area. While I'm stubborn and trying to learn to do it myself, I don't recommend that for others. My videos need help/work and really I should hire someone This is a good example of what not to do. If you want your campaign to look sharp, get a professional to do your video.